NOTE: If the Australian X-Trail Forum is inaccessible due to an extended outage or server over-load, you can log-in to our very own LIVE Chat Room to stay in touch with other members and also find-out what is going on. The Live Chat Room can be accessed by clicking on the box below. (you will only be able to use this chat service when a member of the admin team is logged-in and you also need to register to be able to use it) This chat service is not to be used by NEW USERS trying to register to become members of the forum! The terms WE and US refer to Australian X-Trail Forums. Even though we will make the best possible effort you must recognise due to the real-time nature of this forum: we cannot always monitor the contents of posted messages and we depend upon you to inform us when participants or their messages are violating our policy as stated here. You also recognise that we cannot respond immediately to such notices and that some time may pass before any warranted action is taken. If you stumble across a newbie having trouble with technical stuff you’ve mastered, share your knowledge and help ‘em out. Someone has probably helped you like this in the past and this is your chance to give back like a good citizen! After all that’s what a forum is, if you disagree with someone’s post, challenge it respectfully without attacking the individual. "Flaming" and insults, however, won’t be tolerated, and will be removed. Never post your or anyone else’s personal information in the public forum (phone number, email address, mailing address, etc.) and never ask others for their personal info. Posts requesting personal info will be removed. This includes, but is not limited to, communications that ask for personal information such as email address, address, telephone numbers, etc. Please use the PM function when submitting any of your own personal details to other members but still exercise care and common sense as we will not take any responsibility in the way your information is used by other members you have chosen to share with. - Don't complete posts in CAPS. It looks like you are shouting. - Try to avoid ugly colours. - Don't quote the entire message that you're responding to, only the pertinent passage. Don't create new posts straight after you have added a reply to a thread just for the sake of it, or because you want to get a higher post count for your profile. If you have forgotten to say something or your last post needs correcting, and it is less than 24Hrs old, then use the EDIT feature and fix up your post. The only exception is if somebody has replied to you in the meantime, then you can create a new post to respond back. Double posting effectively increases the length of the thread and adds clutter which consequently makes finding information much more difficult. Members are advised to pay close attention to any links they decide to include as part of their post on our forum. Such links should NOT contain any offensive, sexual and political content. Any non-XTrail or 4WD related linkage is not permitted. Currently each member has a limit of 20 PM's in their inbox. If someone sends you a PM and your inbox is full, the PM will be lost with no notification. So be careful with your inbox, and delete PM's regularly. Please note that due to the sensitive situation around the globe in terms of political and religious matters, all posts containing views and discussions on these two subjects will be removed from the forum. Our forum is 4WD & AWD related and we would like to keep it that way, leaving politics and religion aside. Please note that the Australian X-Trail Forum does not support or condone illegal activity of any type. Posts containing such requests and/or information, will be removed on the spot, repeat offenders will have their account suspended! Use your common sense. Forum posts that contain harassing, offensive, vulgar, obscene, sexual, abusive, hateful, or otherwise unacceptable communications and/or images, including messages that condone illegal activity, will not be tolerated and will be removed. Individuals who don’t abide by these rules may have their account permanently deleted. The information contained in this website is not cross referenced, so don’t take it as gospel. Copies of articles from other sites are included here to avoid out-of-date linkage errors, and the authors and original URLs are credited where known. A person/member posting specific details about a business and/or dealership is fully responsible for the content of that post. Should this lead to a legal action being taken against such claims, Australian X-Trail Forum will take no part or involvement in such cases and the member will be fully responsible to resolve this matter outside of this forum. Please note that the content (Club Sticker, forum content, posts, rules and photos..etc) remains the property of the person that made the post and consequently the property of the Australian X-Trail Forum. This content "may not, in whole or in part, be copied"
unless with prior written permission from the board owner and head administrator. There is enough interest to start-up a group-buy. One of the existing members of the forum who has implemented a mod or is offering a part and/or accessory provides a brief summary of what is involved (parts, costs..etc) to the forum Administrator/s. A member volunteers to coordinate this group-buy and be the central point of contact for all those who take part in it. The Administrator/s will give that member permission to approach the manufacturer on behalf of the Australian X-Trail Forum and the ability to negotiate using the forum name. All financial transactions can only be arranged by the Head Administrator to minimize risks, so any other group-buy which the admin is not involved in, would need to take place whereby participants pay the manufacturer/supplier direct. Members are NOT authorized to negotiate deals with manufacturers or otherwise using the Australian X-Trail Forum name without prior permission of the forum administrator/s. Failure to do so may result in membership cancellation. Members need to be mindful and aware that international group-buy transactions carry an element of risk and may in some cases result in sellers not delivering a product. While the Australian X-Trail Forum would make every effort to minimise such risk, it does exist and it can happen, so please use your own judgement. In order to be able to contribute and submit your own posts and reply to others, you will need to sign up and become a registered user of Runboard. 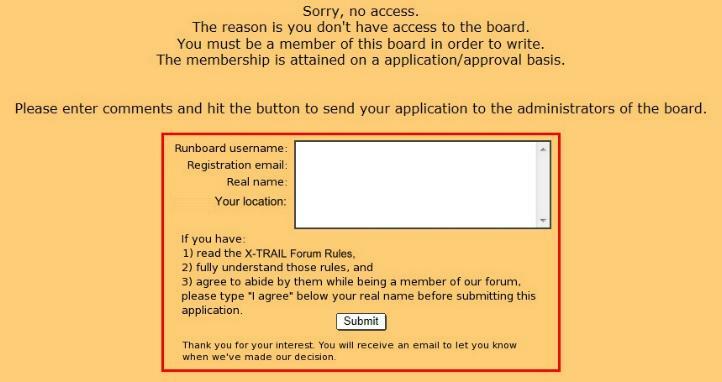 Once you have obtained your Runboard username/ID, you will need to log-in to the Australian X-TRAIL Forum and go to the INTRODUCTIONS (click me) section of the forum. You will then need to press on the big rectangular button that says "NEW POST" click on it and you will be presented with a message saying "that you need to be a member in order to make a post" below this message you will also see an example of how the notes/application needs to be filled (see picture example below), so please make sure you provide and type up the information exactly as shown in the example below to speed up the approval process of your application. Once you have typed-up all of the requested details, press on the SUBMIT button below the application note and wait for an email notification approving your membership or requesting additional information. Incomplete application forms will be rejected and will cause further delays to you becoming a member of our forum. The Australian X-Trail Forum is vehemently opposed to spam, popup ads, spyware and similarly shady advertising techniques. Your privacy is important to us; we will not disclose your email address or your personal information to a commercial third party without your express consent. Important: Your Internet Browser Cookies MUST be enabled to be able to log-in and see the application text box! Registration to Runboard is FREE of charge. You do not need to be a registered user if you just want to view and read the forum.